In a couple of days we are leaving the snow and slush of Stockholm and heading south to sunny Spain for a week. I have some old packing lists from previous trips with Baby A, but we haven’t been abroad since October and a lot of things change over six months with small children. This will be the first trip we do where Alec is completely on solids and pretty much eating what we eat. That makes packing a lot easier. At the same time, he’s up and around now and needs a lot more stimulation and entertainment, especially during flights. Diaper Bag & Extra Carry-on. It’s not possible to fit everything we need for a flight (including back-up changes of clothes etc that we don’t expect to ever have to use) in my regular diaper bag, so I’ll bring an extra bag for the overflow. Blankets. I’ll bring one heavier cotton blanket and a light but very warm cashmere baby blanket. I also always have a pashmina in my diaper bag for an easy cover-up if it’s chilly. A Change of Clothes. A top-to-toe change of clothes just in case. If I’m really smart, I’ll pack a change (at least a top) for myself and my husband as well. A Light Hat. Flights can be cold! Bottles and Pre-mixed Välling. I like to give Alec a bottle at take-off and landing (if he’s not sleeping) to help him to balance the pressure changes. Uniquely Swedish (and Finnish, apparently). Swedish children have välling from around six months until they are a few years old. There are varieties made of corn, oats, rye, rice etc. It’s sort of a cross between formula and cereal and this is what Alec has in his bottle three times a day. Snack Trap. With Cheerios and raisins. Baby Pain Killer. Our doctor recommended giving a dose before boarding and another before landing since Alec has had a bad cold recently. Changing Kit. What I normally carry in my diaper bag should be enough. Diapers, wipes, a disposable changing pad to cover the regular one, plastic bags for dirty diapers, diaper cream, antibacterial wipes for parents. Toys and Books. This includes the iPad with kid apps. Two board books (Alec is quite happy to read the same book over and over again so no need to drag along too many of them). Baby Einstein music toy. I’ll post the second part of our packing list (sleep, care, feeding) tomorrow so be sure to check back! 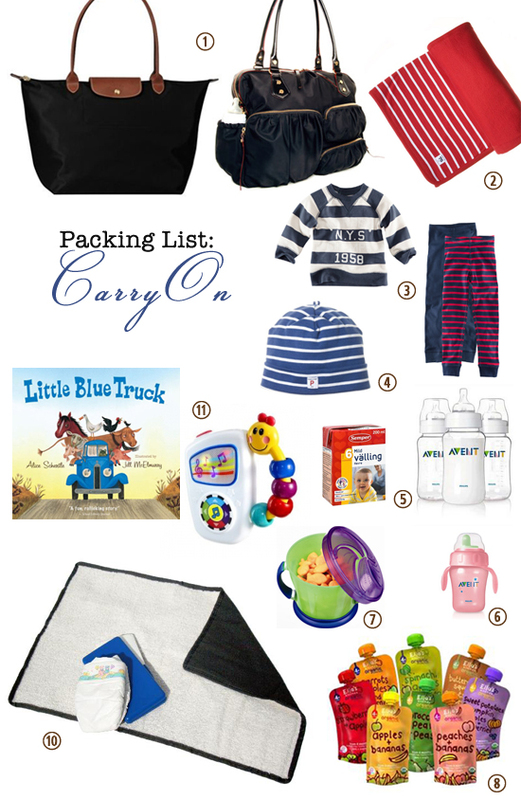 Check out Mini Piccolini’s favourite things for travel here!